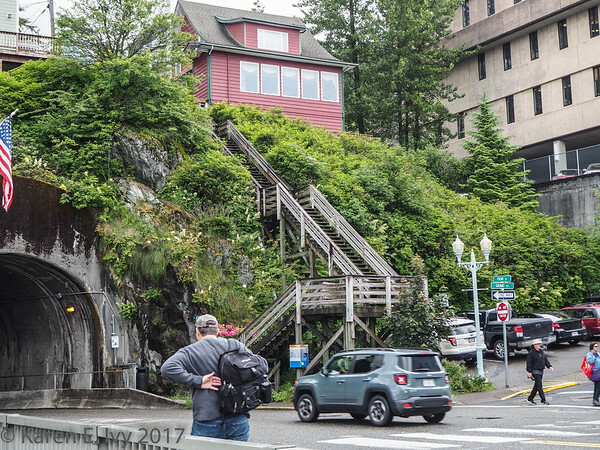 You can’t take notes when you’re walking around a town, but I seem to remember that the land around the Ketchikan harbor was originally much smaller. 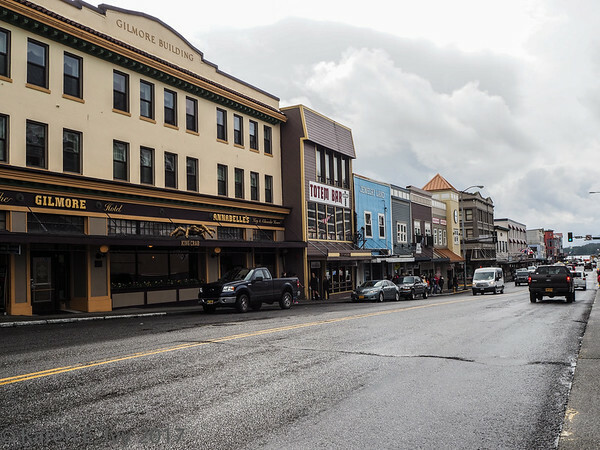 It seems that when the white settlers wanted to build a building, they drove pilings into the ground below the water, and put the building on top of the pilings. 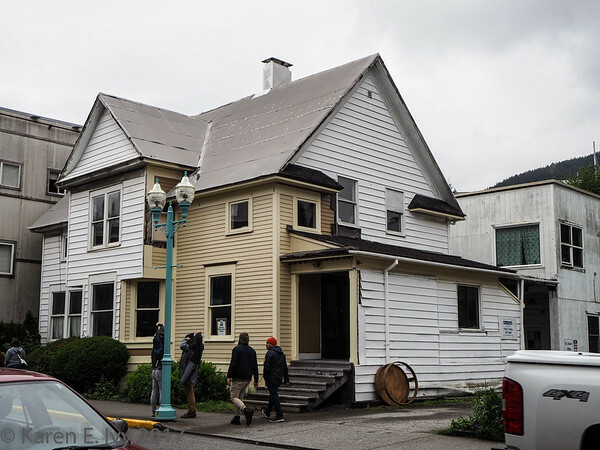 This is one of the 2 oldest buildings in Ketchikan, originally built on pilings and originally used for a hospital. The interesting point is that it’s several blocks back from what is now the harbor front. 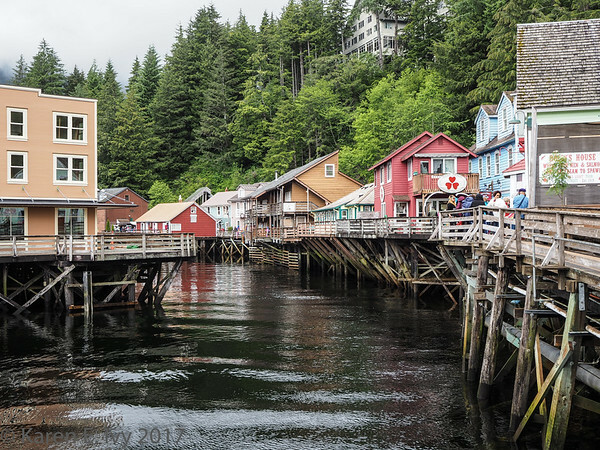 Somehow Ketchikan has extended out into the water. The other oldest building is the Episcopal church, which was also built on pilings. Click on the link to see it. Getting back to the harbor, there are some interesting things along the harbor front. One of the first things you see is the Thundering Wings statue, a wood carving. 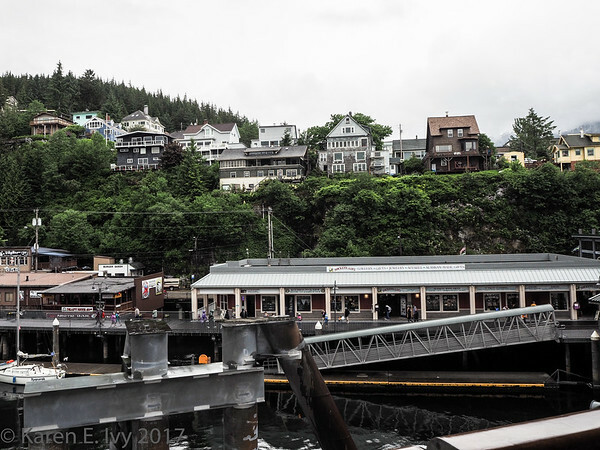 The name “Ketchikan” is believed to come from the Tlingit word “Kitschk-Hin” which means “thundering wings of an Eagle”. The gallery also has a photo of it from the rear, which you can see in the gallery if you like. 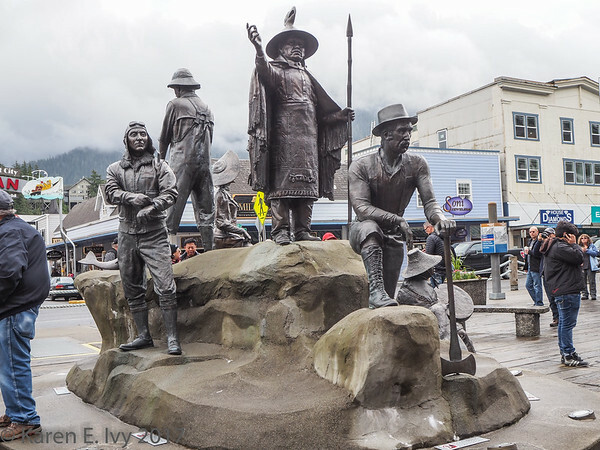 There’s also the Ketchikan memorial statue, known as The Rock. It’s quite a complex carving and I had to take 2 photos, both of which are in the gallery. Click on the link and you’ll see a whole site explaining all the figures on both sides, but here is the front of The Rock. 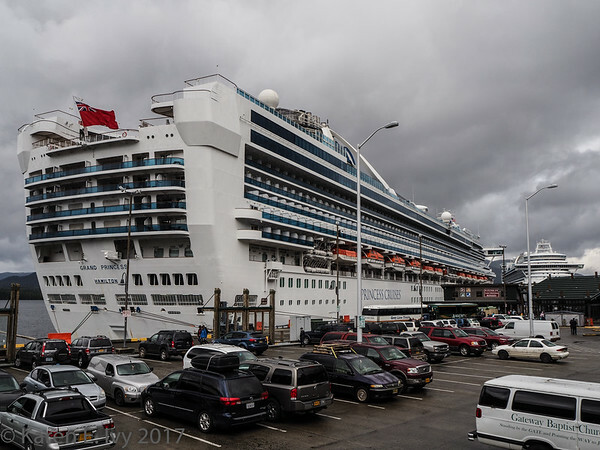 From this photo you can see that Ketchikan is built on a very hilly shore, which is possibly why they put everything on pilings and extended it out into the water. 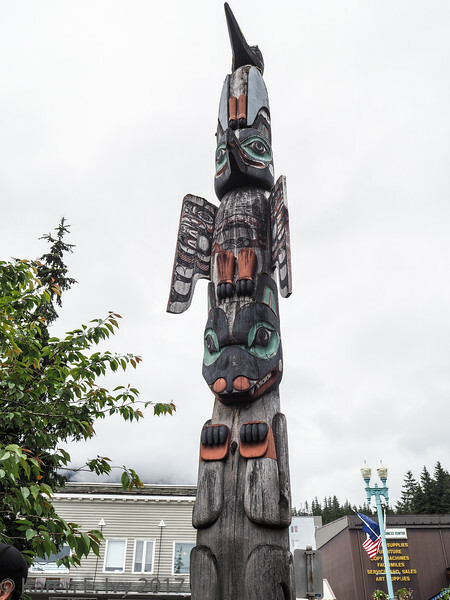 A lot of the walking around we did was to look at various totem poles around Ketchikan. 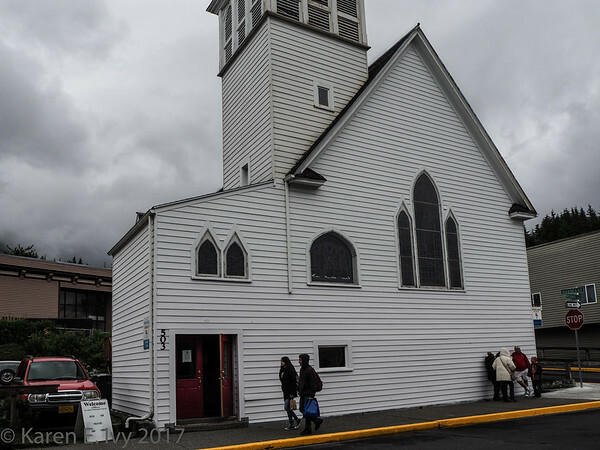 According to ExperienceKetchikan, there are over 80, but since our tour didn’t go to the Totem Heritage Center, we only saw two, which I photographed as well as I could. You can get the full height or the details, but not both. 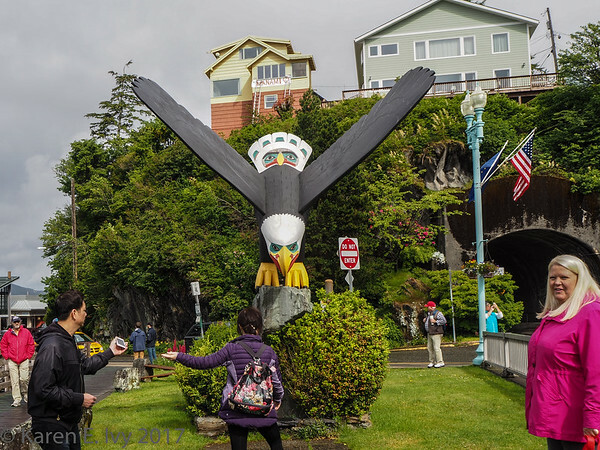 Here’s the one closest to the docks, the Chief Kyan totem pole at Whale Park. 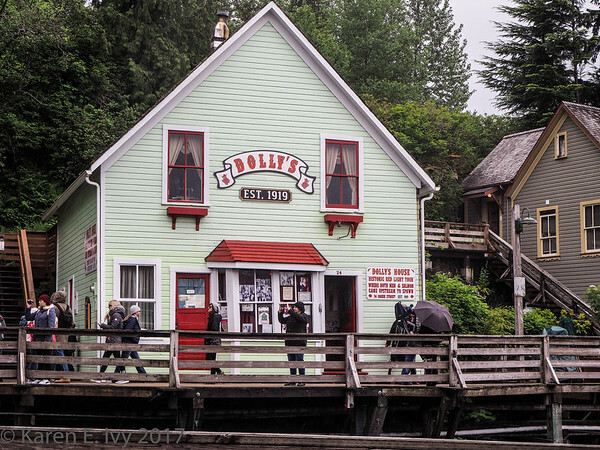 Ketchikan Creek is also a salmon run, so the sign on Dolly’s House reads: “Historic red light tour where both men and salmon came upstream to spawn.” After the walking tour finished, I went to another part of town to attend a show I’d signed up for, but that’s another post. 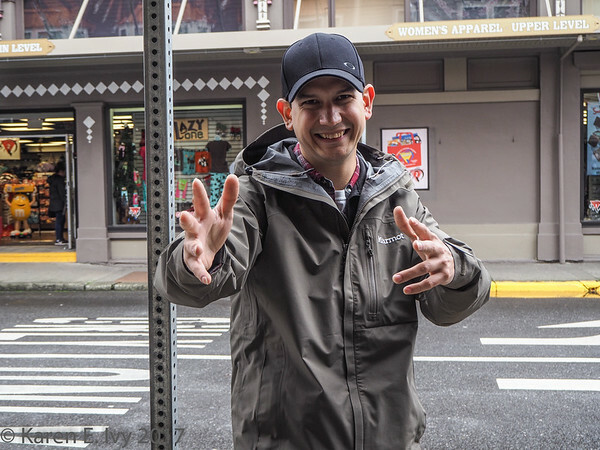 This entry was posted in Personal, Vacations and tagged Ketchikan, Tlingit, Wade in the Water 2017.